Arizona’s largest utility, Arizona Public Service (APS) is in the process of developing a large data center microgrid — 63-MW – with partner Aligned Data Centers, a subsidiary of Aligned Energy. The utility and pay-for-use data center provider are billing the project as a ‘next generation microgrid’ that will include a new 69-kV enhanced-capability substation, located at Union Hills Drive and I-17 in Phoenix. Four different power lines fed from three generation sources will bring electricity to the on-site substation, now under construction. As a result, if one line fails, the other lines provide redundancy to ensure that electricity keeps flowing to the data center. The project will not only supply reliable power for the data center, but serve a larger effort to draw businesses to the area, according to the utility. While large, the data center microgrid will be far from the largest in the U.S. That status often is given to the Robins Air Force Base 160-MW plus microgrid in Georgia or the complex 135-MW microgrid at the University of Texas. Other even larger microgrids are in development, including the Niobrara Energy Park in Colorado, which is planning to serve multiple data centers with a 200-MW gas-fired plant, a 50-MW solar farm, 50 MW of fuel cells, and other energy resources. Data centers and microgrids are considered a natural pairing because of the large amount of energy consumed by data centers and their need for high quality, reliable power. 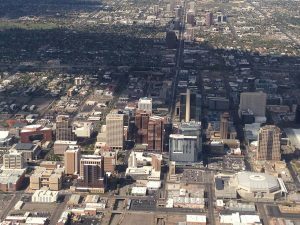 The Arizona data center microgrid will be particularly valuable because it will deliver baseload power and be able to island from the central grid during periods of high congestion, according to the partners. Aligned Data Centers offers a ‘pay for use’ model with consumption-based pricing for enterprises, service providers, and governments who require greater control of data center cost and faster time-to-market. 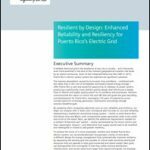 “In addition to a better business model, we are driving to deliver a step function increase in the level of data center reliability, and close cooperation with the utilities is critical to that delivery,” said Carnemark. The project also will use heat-removal technology from sister company Inertech, designed to reduce water consumption by as much as 85 percent. This technology, coupled with other infrastructure enhancements, allows Aligned Data Centers to guarantee a PUE of 1.15, what it describes as the lowest in the market. 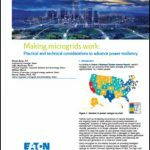 Track development of data center microgrids by subscribing to the free Microgrid Knowledge newsletter. Does Microgrid Software-as-a-Service Hint of a New Utility Business Model?